In my last issue of the New Yorker (not THE last issue, since they get to me in Ireland about a month late), there as an article about sugar and sugar substitutes. I’ve written briefly here and here about our difficulties of trying to find a way to make a natural ice cream without sugar. 1. That sugar is remarkably hard to substitute – its properties in adding bulk, behaving consistently at different temperatures, and just the good taste of it has befuddled scientists for a hundred years. 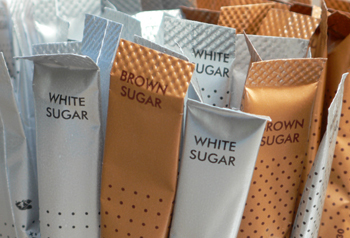 It even seems that scientists will not be looking for the next generation of sweetener like Aspartame or Sucralose but rather will be looking for ways of finding additives that will increase the effect of sugar to enable people to use less. 2. That even with the huge increase of artificial sweeteners, the per capita intake of sugar has increase markedly over the last decades. People are eating artificial sweeteners by the ton AND eating more sugar. We have looked at all sorts of options to try to make a product suitable for diabetics, including stevia, fructose, tapioca and other natural thickeners, and still we haven’t found anything that tastes good enough for us to consider. In addition, the various diabetic associations including Diabetes Ireland seem to be against the idea of diabetic products and are much more interested in a balanced, low-fat diet. I can see why – in Dublin I came across a “Diabetic” chocolate bar that neglected to list the ingredients. I can understand how such products could lull people into a false sense of security. This still leaves us coming up blank. I suppose one way would be to try to find a recipe for a gelato, which is naturally low in fat, and one that has reduced sugar as well. However, what do you add instead? Fruits contain sugar, chocolate adds bulk but contains fat, nuts do the same, andÂ soon we are back at square one! I have taken another day in Dublin, and it has been quite a bit of fun! A bit of business and a bit of pleasure. It started with a visit to the new Donnybrook Fair on Baggot street, where I was happy to see our ice cream in the freezer and bought a bar of Godiva chocolate for breakfast. Off then to the WB Yeats exhibit at the National Library and then brunch at Fallon and Byrne. Their salmon blini topped with an egg hollandaise was supurb, and the fresh orange juice was delicious. Next stop in my rather haphazard tour was Mortons, where I picked up a snack of organic chocolate by Vivani. Now I will follow the advice of Caroline and eat at Ho Sen before heading to the Gaiety for a bit of Kerry theatre with John B. Keane and Year of the Hiker. I love a (mostly) free day in Dublin! 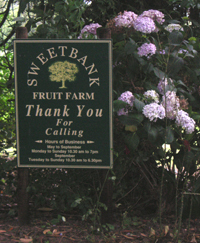 I just brought a load of ice cream to Sweetbank Farm in Wicklow, and it’s great to see them about to open up the farm shop for their second season (June 1st is the first day they open). For anyone who hasn’t been, a visit is highly recommended. David and Debbie know their fruit, and their little shop is lovely. The old farm buildings are built around a courtyard, and the stalls hold a variety of animals that are great entertainment for kids. They also have fresh meats, a scooping cabinet with the efforts of yours truly, and an array of other goodies. Devouring a bowl of fresh fruit with cream and a coffee in their picturesque courtyard on a nice sunny day is about as good as it gets! Their efforts are a lesson in agritourism! We will be taking delivery of some of their fruit for our ice cream within the next few weeks, and anyone who has had our Wicklow raspberry, strawberry or tayberry ice cream will know what a treat their fruit is. This year they have also promised us cherries. Mmmmm! There are many people who think that there is difficult to eat out well in Killarney. For the most part, I agree, perhaps because there has been little incentive for restaurants to change or improve. There are just a handful of places that I know of that are good value and interesting. Lunch at the Park Hotel bar is an old standby and definitely recommended, and besides that it’s worth looking at some of the ethnic entries into the restaurant market. One of the benefits to the New Ireland with its immigration is the proliferation of ethnic cuisine. The best of the Chinese is the rather tragically named Jungle Bell that is hidden away in the Inisfallen Centre off Main Street. It’s quite a bargain and a good find forÂ those who don’t want to spend a fortune. Just opposite and up the stairs is an excellent Thai restaurant, Genting Thai. I’m regularly in there for the phad thai. If you feel like cooking ethnic at home, also in the Inisfallen Centre is an Asian and African market that’s definitely worth a look. The best of the Indian restaurants is the very popular Bombay Palace on College Street, and you couldn’t go to wrong eating there. There certainly are other places to eat, and I’ll come back to this later. It’s definitely worth doing your research! We’re making good progress using the Kerry Cow milk here in ice cream land. Today we made our second batch, and it’s a big improvement from the last one. 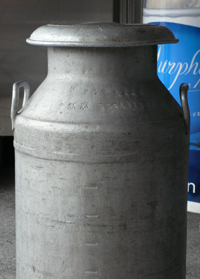 Milk straight from the farm is such a different proposition from milk bought in the shop, and it’s wonderful to have it in its pure form, with the thick cream rising to the top of the churn and the farm-fresh smell of it. Technically, though, it’s a bit of a challenge. It’s amazing how a single ingredient can change the whole taste and feel of a batch. It will take us a little while to get it right, but I’m sure the ice cream will be greatly improved. It’s no harm as well to be able to support a local farmer, even in our own small way, and I hope that small food producers such as ourselves will be able to make a difference with keeping Irish farmers on the land. I have never been much of a gardener (to say the least) but luckily my sister-in-law has quite the touch with plants. When I visited yesterday, she handed me a beautiful bunch of mint, and I went home to decide what to do with it. I thought first to go making granita, which I might attempt today, but after the glow of the Munster match and the warmth of the sun in the afternoon, I decided to make a mojito. 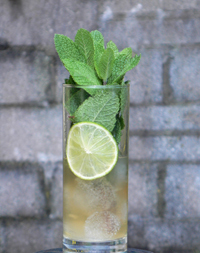 It’s surely one of my favourite cocktails, and if you can’t get to Cuba and have fresh mint handy, it will give a lift to any day. By the way, I was quite pleased to see it on the drinks menu in Mackerel on my last trip to Dublin. Sadly, I had to drive home, so I had to pass on a lunchtime indulgence! 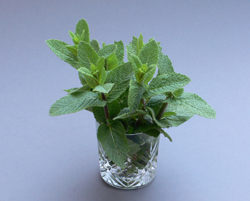 Combine all the ingredients except the lime in a tall glass and stir vigourously to release the flavour of the mint. Squeeze in some lime juice, then drop in the lime slice. Stir again. There are those who would strain it, but I think it’s much more dramatic with the mint still in place, and although it might tickle the nose, the scent is divine! Today, with the rain pouring down and the murkyÂ half-light of West Kerry taking away any sense of summer, I decided to cheer myself up by baking. I did two chocolate tarts (shown above)Â for the shops as well as a pair of lemon tarts. I was quite pleased with the results. 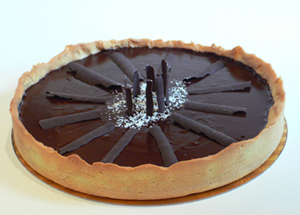 The chocolate tart is based on the Payard book I’ve been talking about, although I made a few changes – another egg yolk, a slightly different pastry, and a combination of bitter and dark chocolate. Mind you, there was more to be cheerful about, since we took our first delivery of Kerry Cow milk from a local farmer, and we made a batch of ice cream. It’s amazing how much changing a single ingredient changes the entire ice cream. 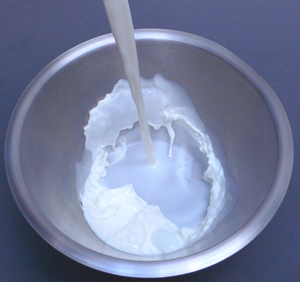 The Kerry Cow milk is much creamier, and it will take a bit of playing to get it right. Still, for a first run, we were quite pleased with it. One of the flavours JP made from it was Stewed Apple and Galliano. It’s a great combination, and I must commend him! Yesterday I had a chance to return to Payard’s Simply Sensational Desserts. After the success with his lemon tart and reasonable luck with his chocolate tart, I decided to tackle his chocolate mousse cake. 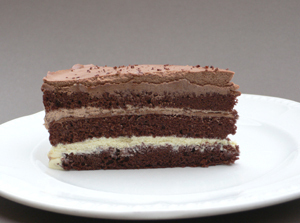 In the book he suggests two mousses – milk and dark chocolate, but he mentions that he makes it for his own shop with three – white, dark, and milk chocolate. So I did that very thing, using Valrhona for the bitter chocolate, Lindt for the milk chocolate, and Green and Black’s for the white chocolate. For making a chocolate emulsion he has a different method than I described before. It’s a tricky thing making a chocolate emulsion, and he gets around it by chopping the chocolate, adding boiling cream, and stirring it until the mixture is smooth. 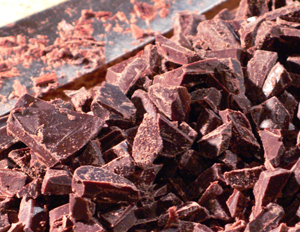 This works very well and has a velvety result, if you have the patience to chop all that chocolate! However, I think we’ll stick with our method for the chocolate sauce and hot chocolate!